What is the single most important skill your guitar students must learn from you to become awesome musicians fast? Is it guitar technique? Is it music theory? Ear training? Songwriting and improvising skills? The most important skill you can ever teach your guitar students is how to practice guitar correctly and consistently. Fact is, your students do NOT become better guitarists during the lessons they have with you. Their progress is determined by what they do (or don’t do) at home in between your lessons. Until you get your students to consistently and correctly practice on their own, their guitar playing will progress very slowly (if at all). This lack of progress drives many students to quit lessons and reflects very poorly on you as a guitar teacher. Before reading the rest of this article, take this 2 minute test to find out how good you currently are at getting your guitar students to practice. Then finish reading this article to learn the key steps for mastering this area of your guitar teaching. Master guitar teachers know that they don’t teach guitar/music - they teach people. This involves taking a genuine interest in your guitar students, their mindset, their desires, their guitar playing goals and the reasons behind those goals. All students become inspired differently and have different reasons for wanting to play guitar. 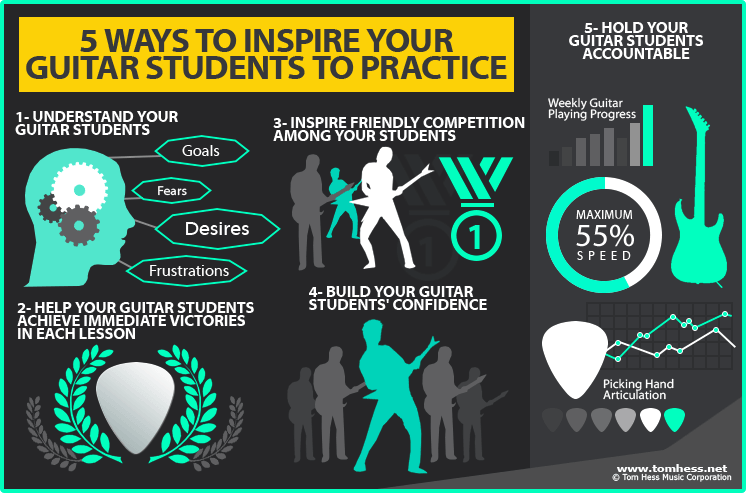 Uncovering these reasons will help you to tailor your lessons (and practicing expectations) for your guitar students in the best way possible. When your guitar students see that you understand them and believe that you are sincerely interested in seeing them succeed, they will like and trust you a lot more and will be much more willing to do what you say. This connection and rapport is the foundation of your ability to motivate them to practice. This influence will be even stronger when your guitar students see a clear connection between practicing guitar and the results they get (or don’t get) in their playing. More on this below. Your guitar students achieve immediate results (and become a little bit better as players) right in the lesson. This will get them excited about your lessons and will inspire them to do more practicing at home. Your guitar students will experience what it means to practice guitar perfectly. When your students practice in front of you, you can correct their mistakes and maximize the chances of them practicing correctly at home. Learn how to attract new students, earn a lot more money and more. to practice to get better results. Most guitar teachers get this dead wrong and instead try to teach their students as many new things as possible in each lesson. Others (falsely) assume that telling their guitar students what to do equals “teaching them how to practice”. This common guitar teaching flaw guarantees that most of your students will NOT practice correctly at home and won’t make much progress between lessons. Worst of all, their lack of progress will make them want to practice guitar less and less in the future. To learn how to solve this problem and get your students to become better guitar players in every lesson, read this article about teaching your guitar students to practice. The things you tell them to practice (and the way you train them to practice) is moving them towards their guitar playing goals. This positive reinforcement will get your students to trust you a lot more and will greatly increase their motivation to practice guitar. Your guitar students will be a lot more motivated to practice when they see your other students become better players alongside them. Use this positive pressure to your advantage by establishing some healthy competition among your guitar students. Showcase your best students and explain (to your other guitar students) that they will also become great by doing the same things your top students did. The best (and easiest) way to promote this friendly competition among all your students is to NOT teach in 1-1 guitar lessons only. Incorporate some group lessons into your guitar teaching model to give your students extra motivation to practice guitar and help them become better guitarists much faster. To learn more about how teaching group lessons will transform your guitar teaching effectiveness (and income) watch this video about building your guitar teaching business. Very often, your guitar students won’t practice enough because they don’t realize how much progress they’ve made from taking lessons with you. To solve this problem (and motivate your guitar students to practice), track their progress in every area of guitar playing/musicianship and periodically remind them of the progress they’ve made. This will show them proof that their practicing has enabled their progress to occur and make them more motivated to keep practicing consistently. As a (major) side benefit to you, showing your guitar students proof of their musical progress will motivate them to remain your students much longer. To learn the very best way to track musical progress for guitar players, check out the Guitar Playing Accelerator. As you apply these five keys for motivating your guitar students to practice, you will see your students make more progress than they ever have before, helping build YOUR reputation as the expert guitar teacher in your local area. To get more help with training your guitar students to practice effectively, take this assessment to find out how good you are at teaching your guitar students to practice. Your Guitar Students To Practice? Become the #1 guitar teacher in your area by learning how to teach guitar.